ST. LOUIS - Webster University is looking for a few good opinions. Students, faculty and staff are invited to review and offer feedback on the furniture being considered for the Interdisciplinary Science Building (ISB). 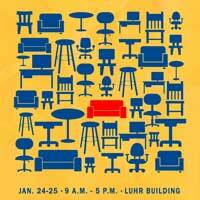 The ISB Furniture Fair will be held 9 a.m. to 5 p.m. Jan. 24 and Jan. 25 in the Luhr building. Furniture for classrooms, lounges, work areas, faculty offices and conference rooms will be on display. Visitors will be allowed to try out the furniture and then tell representatives of Spellman Brady & Company, the University’s furniture consultants, what they like or dislike about the equipment. The final selections will then be announced to the University community before the end of the school year. Light snacks will be offered. There also will be drawings for special prizes both days. Visitors to the fair will be asked to judge the product style, function, comfort and durability of all the furniture. It’s estimated that a complete review of the pieces on display will take approximately 45 minutes. To better put the furniture in context, renderings of some of the interior spaces of the ISB will be displayed. The ISB has been a collaborative effort since it was first proposed. Architects and administrators have been regularly meeting with groups of faculty and students to get their input in the design and potential use of the building. Those meetings are still continuing throughout the construction project. Last month, the community was invited to a “Topping Out” ceremony. During that event, students, faculty and staff were able to sign a steel beam placed in the building, thus ensuring their names would become part of the building for decades to come.